I found this stray dog and I would like to keep her. I've already have a large dog and her size is a big consideration. I believe she's about 8-11 weeks old and about 3-4 pounds. She's mostly white but she has a little blonde in her fur. I've been to two different vets, one thought maybe she was a German Shepherd mix. The other said she would be much smaller like a spitz mix. Her ears tend to go up and down from time to time. Any ideas on what breed she might be? 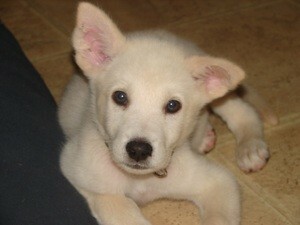 She looks just like my puppy did at that age, mine was a little fluffier maybe, she's a spitz/border collie mix! (yours definitely has Spitz though) Mine's about 50lbs but no more. I'm guessing a Jack Russell terrier mix. not sure what the other part of the mix would be (border collie or lab might not be a bad guess). My Jack Russell weighs 8 pounds and she has almost the same face; hers is a bit thinner. Her coat is not as thick either. My guess is that yours will end up being medium sized, not huge, maybe 30 ish pounds. Enjoy her. 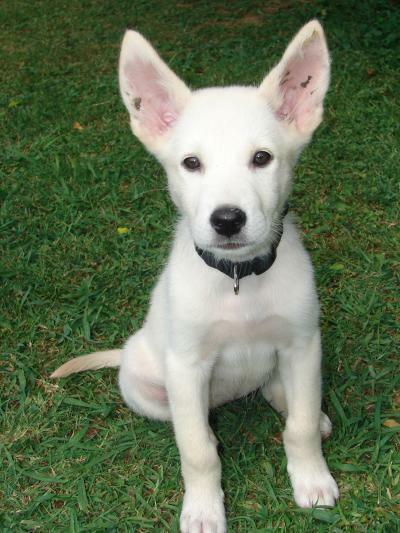 My husband raised white German Shepherds when he was growing up and your pup looks much like one. UPDATE: Thanks for the comments! I have decided to keep her, my other dog (a german shepherd) loves her! Her name is Micsha. I have taken her to the vet for her second shots, she's now about 14 15 weeks and about 10 pounds.